'Villa Marina', the Frank C. Henderson estate designed by Warren & Clark c. 1920 in Roslyn with landscaping by Hatton & DeSuarez and a golf course by Devereux Emmet (who resided at 'Sherrewogue' in St. James). Henderson was an Oklahoma oil operator, his obituary said that after college he "followed the sea" before he entered the oil business where "he made a fortune". 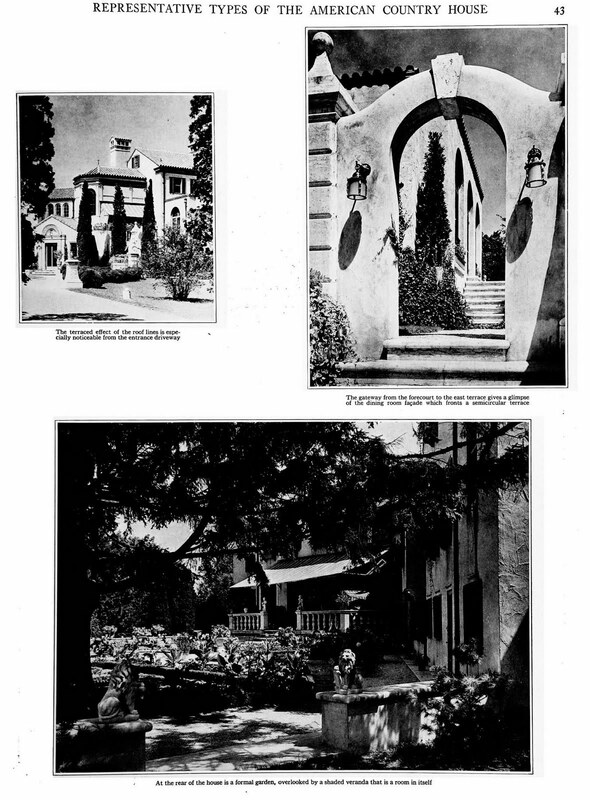 The Hendersons also owned a home in Palm Beach named 'Land's End' (what are the chances?). 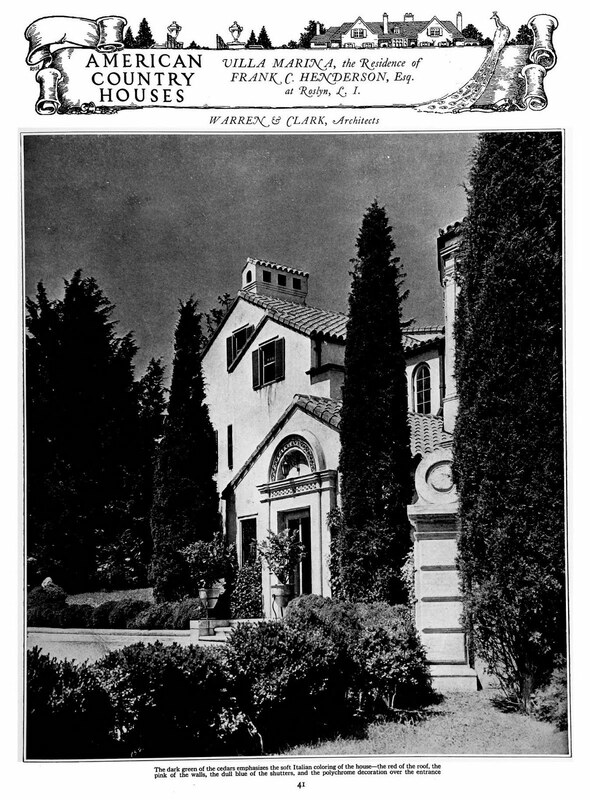 The home was subsequently owned by Harold Henry Will before it became the Pierce Country Day School & Camp (of which I attended as a little kid and remember this house well). Click HERE to see 'Villa Marina' on google earth and HERE on bing. I went to Pierce day camp as well one summer. Wish I remembered the house. Zach, I’m grateful you supplied floor plans to go with these photos – I appreciate these ‘free form’ Mediterranean/Spanish styles but they are difficult to figure out from looking at windows (also, the roofs often have water drainage problems … but that’s another topic). Interesting floor plan – providing a breeze through each of the public rooms (in these days before air conditioning); the ‘personal maid’s room’ directly above the mistress’ bedroom & boudoir; but only two ‘regular’ servant’s rooms (I’m sure this house required more). The original landscaping is beautiful. It’s nice this house still stands although it appears Pierce Country Day School & Camp is not an overly sympathetic preserver of architectural heritage. & yet it was possibly an early influence on Zach’s current passion in preservation & restoration. I won’t ask why you remember this house well, Zach … but does it have to do with where the principal’s office was? Not school...day camp. I remember as a very little kid (ages 4 and 5) we would go upstairs to the second floor to a room that had a big fireplace (which I believe must be one of the guest rooms on the floor plan) and we would sing camp songs about Pierce. Something along the lines of 'Cheers, cheers for all of the fives..we are the greatest campers alive' and so on. We ate our meals in the giant room they made out of the loggia and I remember occasionally eating in what must have been the living room because I remember it had a fire place (and wood paneling). It's funny looking at the entire place on Bing because as a kid it felt absolutely enormous but from up above it doesn't look it. I think I spent 6 summers there believe it or not. I went to Pierce for nursery school and summer camp. It was great fun, particularly driving go carts around the circle. I too very clearly remember the entrance stair way and the big room with fireplace. 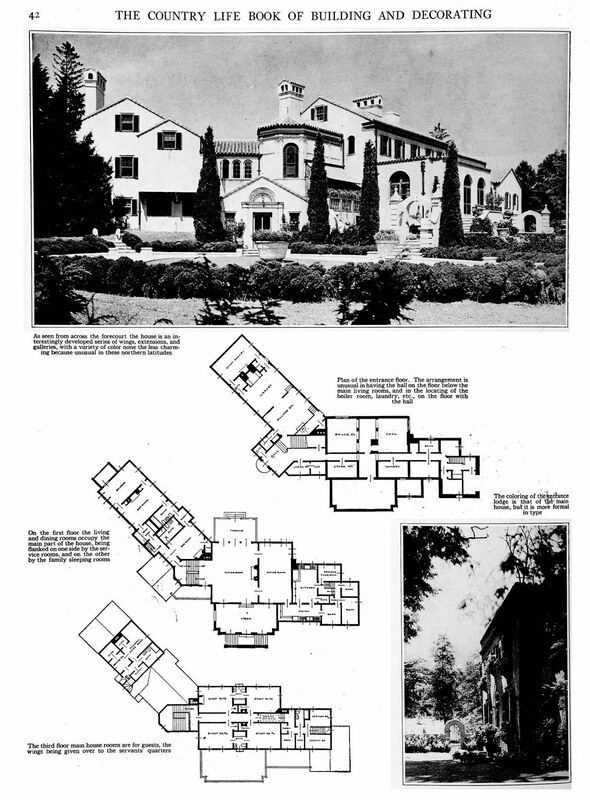 While I agree the Pierce's have not been ideal preservationist it is a better "adaptive reuse" than a subdivision. Incidentally, there is another camp behind Pierce called Shibley (Shibley, Shibley, boo, boo,boo-stick'em in the trashcan,two by two) and behind that is the wonderful old Brower estate, which fronts on Main street in Roslyn. When combined it makes for a pretty impressive architectural grouping and significant open space for the area. zach et al - you lucky dogs. what a place. i love love love it. all those spanish roofs and stairs going in all directions. a maintenance nightmare for sure but a fairytale house even if it is in new york. also, i don't think he had two places - i think he just shipped one back and forth depending on the season. this one would fit right in in palm beach. Read the very last post. Another "Lands End" in the making??? Check the links - one of them has a hyper-link to a Facebook page showing the demo. 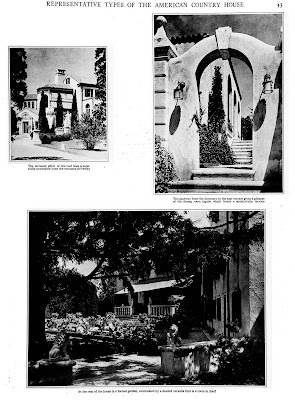 Planting Fields and Old Westbury Gardens front and back. Next: Rynnwood/Banfi,Northwood/Schiff,Nevis/Boscobel (Cove Road, Oyster Bay Cove), Woolworth, Ormston ,Killenworth,Webb Institure, Cobble Court/Luckenback,Henry U. Harris,W.R. Grace,Chelsea, Falaise,The Chimneys/Holmes,Beacon Court/Belmont, Eagles Nest,Cassini/More,Sidney Mitchell/Rechler, Clews Lane,James Blair/Ontare and Oak Knoll. DED, you are correct regarding the floor plan; thanks for taking more time than I did to figure out what made sense. Zach -- point taken regarding day camp. In my defense in the time & place where I grew up day camp was your mother saying, "Why don't you go outside & play?" I know that sounds like a question but, believe me -- it wasn't. I know that's unthinkable today, but that's the way we did it.